I never realised how challenging it would be to get information on Rhodesian Army defoliation efforts on Cordon Sanitaire or anywhere else for that matter. One of the main reasons for this is that these activities took place, and were more or less completed by the time I joined the army. It is disappointing that so little is known of these activities and I apologise in advance for the scant information at hand. This is definitely one of those posts where I could do with all the help I can get. However I have managed to cobble some data together thanks to Terry Griffin and Vic Thackwray (a big thanks to both of them who incidentally were also both my Commanding Officers, at different times of course), and also a number of publications. It would however seem that very little information on this aspect is available. As a starter to this post it is probably useful for some readers to have a better understanding of what defoliation is all about, why it is used during military operations, the main methodologies used, and historical results both positive and negative. Without question the use of defoliant by the US military during the Vietnam War (and Korea before that) is the best example of these activities and they are well documented, mainly for all the wrong reasons. A short preamble will therefore follow and we will then look at Rhodesian Army efforts according to my understanding of things. Probably the most well-known chemical defoliant used to date is Agent Orange. Agent Orange was a powerful mixture of chemical defoliant used by U.S. military forces during the Vietnam War to eliminate forest cover for North Vietnamese and Viet Cong troops, as well as crops that might be used to feed them. 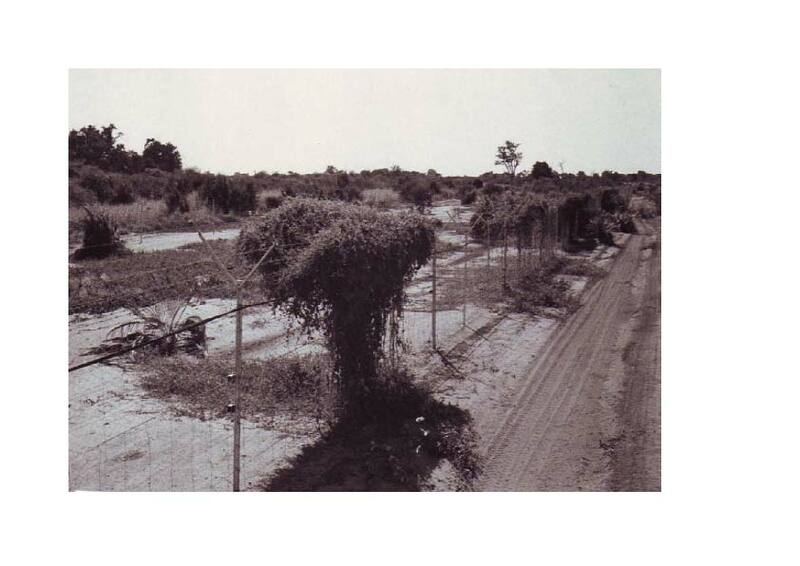 The U.S. program of defoliation, codenamed Operation Ranch Hand (http://en.wikipedia.org/wiki/Operation_Ranch_Hand), sprayed more than 19 million gallons of herbicides over 4.5 million acres of land in Vietnam from 1961 to 1972. Agent Orange, which contained the chemical dioxin, was the most commonly used of the herbicide mixtures, and the most effective. It was later revealed to cause serious health issues–including tumors, birth defects, rashes, psychological symptoms and cancer–among returning U.S. servicemen and their families as well as among the Vietnamese population. Agent Orange was the most commonly used, and most effective, mixture of herbicides and got its name from the orange stripe painted on the 55-gallon drums in which the mixture was stored (see picture below). It was one of several “Rainbow Herbicides” used, along with Agents White, Purple, Pink, Green and Blue. U.S. planes sprayed some 11 million to 13 million gallons of Agent Orange in Vietnam between January 1965 and April 1970. According to the U.S. Department of Veterans Affairs (VA), Agent Orange contained “minute traces” of 2,3,7,8-tetrachlorodibenzo-p-dioxin (TCDD), more commonly known as dioxin. Through studies done on laboratory animals, dioxin has been shown to be highly toxic even in minute doses; human exposure to the chemical could be associated with serious health issues such as muscular dysfunction, inflammation, birth defects, nervous system disorders and even the development of various cancers. Photo and parts of the above paragraphs in italics are from http://www.history.com/topics/vietnam-war/agent-orange. The British used Agent Orange in Malaya, but for the very British reason of cutting costs…The alternative was employing local labor three times a year to cut the vegetation. British stinginess over this matter in one respect helped to avoid the controversies provoked by the use of Agent Orange in Vietnam. The original intention was to crop spray but even this was deemed too expensive by the protectorate authorities. Eventually someone struck on the idea of simply hosing the jungle from the back of bowser trucks and this is what the British did, in limited areas and to no great effect. 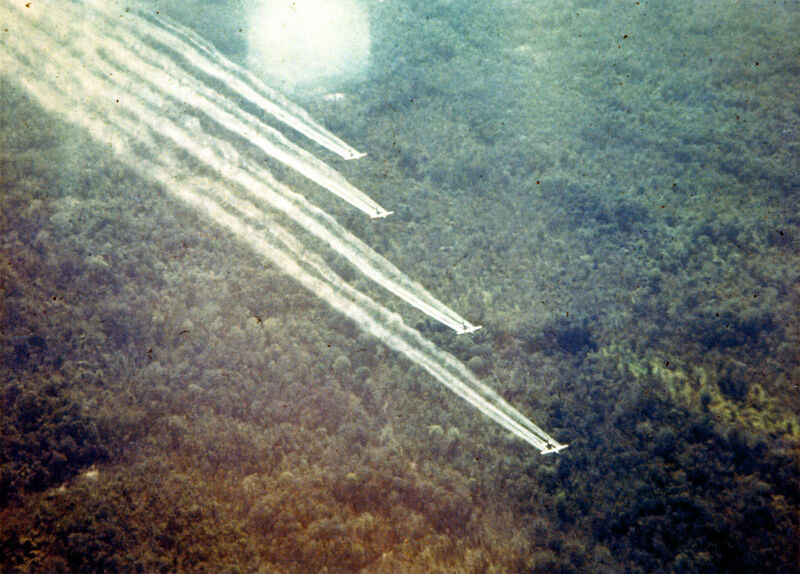 This happily amateur effort at chemical warfare undoubtedly saved future British governments from the litigation suffered by post-Vietnam US governments (http://www.psywarrior.com/DefoliationPsyopVietnam.html). In fact the US were largely inspired to use chemical defoliation from the good old Brits. Mechanical defoliation makes use of heavy earth moving machinery to excavate, bulldoze or scrape vegetation out of the ground. This cannot be considered as permanent a method as using chemical agents but it has the advantage of being localised to where the machinery is being used. Crucially it does not spray poisonous herbicides from here to eternity, or cause long-lasting sickness and disease. 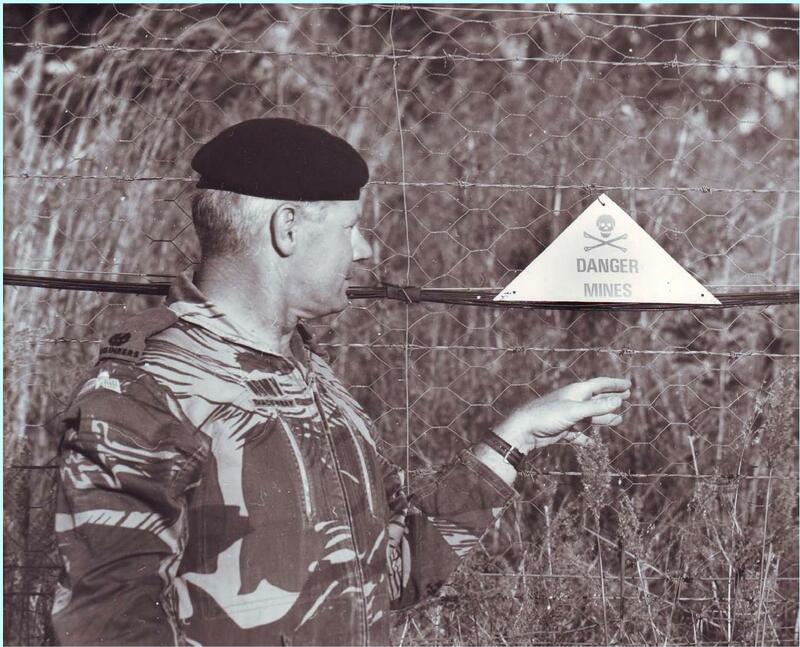 The Rhodesians used a combination of mechanical and chemical defoliation methods on Cordon Sanitaire and Non-Cordon Sanitaire operations. So Rhodesia was apparently not squeaky clean as far as using herbicides was concerned although very little is known of their use, or the extent of such use. There is also no objective evidence that shows what if any residual effect there was on the local population and indeed our own troops. Perhaps this is an aspect that no one wants to talk about or perhaps it was just one of those activities no one knows much about. Somehow I have a feeling there is someone out there who knows a lot more about this activity. 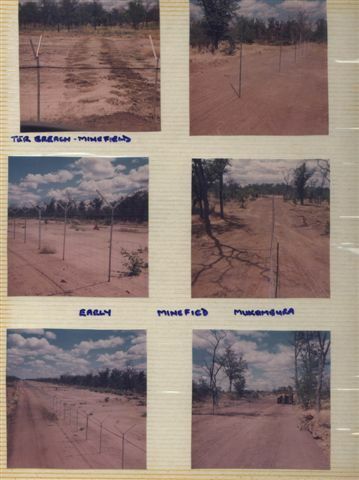 The Rhodesian Corps of Engineers were responsible for clearing the 25 meter wide strip of land that would eventually become the minefield with bulldozers. This mechanical defoliation methodology was used primarily to make the job of laying mines easier and to make the terrain more suitable in general for manual, dismounted operations. Laying mines in vegetated areas is both dodgy and dangerous. One can very easily become disoriented with disastrous results. It seems that the Cordon Sanitaire planners were not happy with only a 25 meter defoliated corridor and gave orders to chemically remove vegetation 150 meters either side of the Cordon fences (I have to wonder how this was achieved using back-pack hand-operated sprayers). In a bid to save on costs they substituted HYVAR-X with a different chemical known as TORDON 225. This would prove to be a costly mistake as this product was ineffective and resulted in Rhodesia instituting court action against the South African manufacturers of TORDON 225. I found only one record of chemical defoliation usage. This was apparently on the Musengezi, Mukumbura, and Nyamapanda to Ruenya minefield. Nothing else is available. The following two photos were sent to me by Vic Thackwray, a Cordon Sanitaire veteran. They show the cleared areas between the minefield perimeter fences. In the first picture the minefield is on the left of the fence. A parallel minefield maintenance road can be see on the right of the fence. This specific photo was taken at Mukumbura. The second photo is a great shot of Vic Thackwray standing next to the Cordon fence. Note the thick vegetation inside the mined area. The photos above were provided by Terry. They too show the type of terrain and vegetation of the Cordon at Mukumbura. I must add the terrain was not always as good as what is shown and from my own experience this was as good as it got (so don’t think we had it easy all the time). The very first minefield laying etc (again) I was OC of that – starting at Mukambura. Lt Col Horne actually came up with the team I had trained – for a look see. Tsetse were (as per normal) responsible for erecting fences but we also had plant tp folk with bulldozers and graders clearing all so we had bare earth in and outside the minefield to work on. This was also to prevent gooks taking cover in the bush. At that stage the minefield was approx. 25m wide. In no time I realised this method was an absolute waste of time money etc, etc as we also provided armed protection for the dozer drivers etc way ahead of laying teams. To keep a definitive 25m width etc was patently stupid so I wrote a paper and suggested fences meander to create doubt as to depth of field – albeit still 3 rows – and do NOT clear vegetation as it then aided in camouflaging all. I sent you some pics of the first gook breach and just look at the nice clear earth with fences visible at exactly 25m. Boy did we have a lot to learn – and quickly. This is the only defoliation that I am aware of?? Basically I was tasked with doing the defoliation on Chete Island after the gooks wacked the civvy ferry. I called up S Tp from 1 Sqn albeit I was OC Boats at the time and then we sailed plus Tsetse in the Army ferry (Ubique) from Kariba to Chete. Had strike craft as back up and positioned one at each entry to the gorge as it had been declared a frozen area for all craft during the OP. Went ashore (after anchoring on the island – invading enemy territory !! – to clear it of gooks – if any. There were none. Tsetse also provided back up (Jack Kerr plus another) with ,458 rifles in case elephants had a go at us. They did not. After positioning the guys in a defensive role we cleared the area where the gooks had fired from – onto the ferry – which still had much kit lying around from the firing point. Tsetse folk then used a defoliant called Hivar (as I recall) and by hand distributed like it was fertiliser along the entire bank facing the gorge and inland a short way. This would (as it did) clear that sector of all foliage and thereby (hopefully) deny natural cover. After the first rains it was evident all was dying off and it did clear all fairly quickly creating a rather bare scar along that section of the island. Some 10 years later it was still very visible but on my last fishing trip there + – 4 years ago all had now regrown. The gooks never did use the original firing position again. Looking at this post I realise that although I would have liked to give the reader more on the actual defoliation in Rhodesia, what we have here is real Rhodesian Millitary Engineering history. The accounts by Terry have probably never been recorded in this format before and the photos from Vic still give me goose-bumps, bringing back a part of my history that must be told or it will be gone forever. Thanks to both of them once again for all the help and support they provide to me. Perhaps no two people embodied the moral complexities and the agony of Agent Orange more graphically than Adm. Elmo R. Zumwalt Jr. and his son Elmo R. Zumwalt III. Admiral Zumwalt led American naval forces in Vietnam from 1968 to 1970, before he became chief of naval operations. He ordered the spraying of Agent Orange. The son was in Vietnam at about the same time as the father, commanding a Navy patrol boat. Years later, doctors found that he had lymphoma and Hodgkin’s disease. He died in 1988 at 42. His son, Elmo IV, was born with congenital disorders. Perhaps this post has digressed a bit from the title but it does make for interesting reading I hope. In the next post we will look at Cordon Sanitaire with electronic alarms. © Mark Richard Craig and Fatfox9’s Blog, 2009-2014. Unauthorised use and/or duplication of this material without express and written permission from this blog’s author and/or owner is strictly prohibited.